Canal Day 2019--Now Accepting Applications! 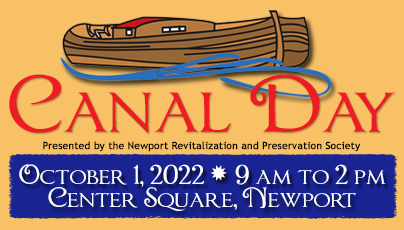 NRPS is accepting space reservations for Canal Day 2019, which will be held on October 5th from 9 am to 2 pm. This is a popular event that draws a large crowd from Newport and surrounding communities. The fee for a 10' x 10' space is $25. Electricity is available on a limited basis for an additional $10. Download a PDF form or Word form and mail your request to NRPS, PO Box 13, Newport, PA 17074. Space reservation forms may also be dropped off at Carpetbagger Collectibles, 12 South 2nd Street, Newport. Call or email the contacts listed below before sending a space application. Questions? Please email Laura Campbell at lcmpbll@hotmail.com or call Lorri McNaughton, Carpetbagger Collectibles, (717) 567-3153. Following is information from last year's event. 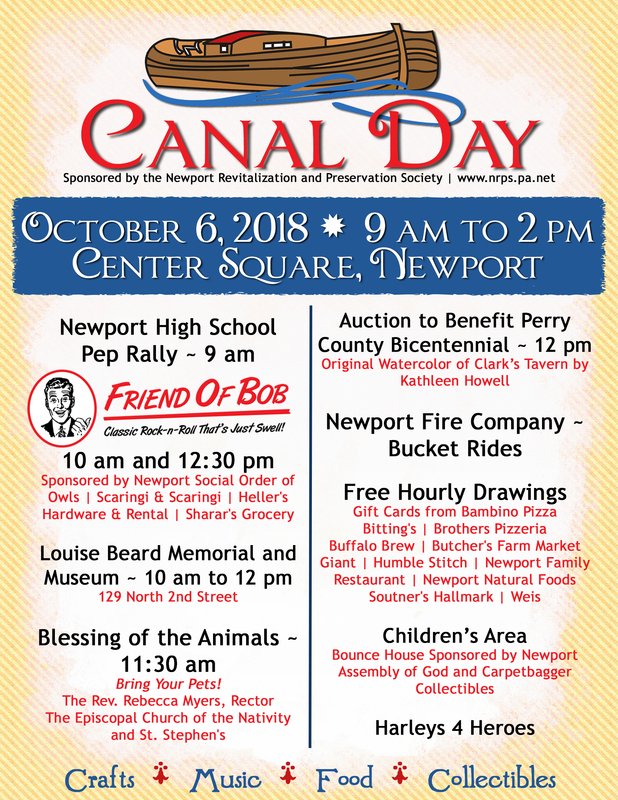 Join us in the Newport square on October 6, 2018 from 9 am to 2 pm. Our vendors are ready for a great turnout! 9 am -- Newport High School athletes, cheerleaders and band will kick the day off with a pep rally. Are you a sucker for the classic rock songs of the 60s, 70s, and 80s? Friend of Bob is a four-piece classic rock and roll cover band from the Dauphin and Perry County area that plays all your favorite classic rock songs. Friend of Bob formed in 2011 from musicians that have been playing in the local music scene for many years, some dating back to the 70s. Their talents and experiences mesh together bringing a fun, energetic, and memorable live experience. Friend of Bob for classic rock-n-roll that's just swell. 10 am to 12 pm -- The Louise Beard Memorial and Museum, 129 North Second Street, will be open. 11:30 am -- Blessing of the Animals with The Rev. Rebecca Myers, Rector of The Episcopal Church of the Nativity and St. Stephen's. Bring your pets or a photo of your pets for a blessing! The blessing is a custom to celebrate and to remember St. Francis of Assisi and his love of animals. 12 pm -- Auction to benefit Perry County Bicentennial. 12:30 pm -- Friend of Bob sponsored by Newport Social Order of Owls, Scaringi & Scaringi, Heller's Hardware & Rental and Sharar's Grocery. Hourly -- Stop by the NRPS stand to fill out a chance for a free gift card! Drawings will take place every hour and you do not need to be present to win. Thank you to Bambino's Original Pizza, Bitting's, Brothers Pizzeria, Buffalo Brew, Butcher's Farm Market, Giant, Humble Stitch, The Jewel Box, Newport Family Restaurant, Newport Natural Foods, Soutner's Hallmark, Terror Farm and Weis Markets for donating gift cards! Be sure to visit the free children's activity area! There will be a bounce house sponsored by Newport Assembly of God and Carpetbagger Collectibles. The Newport Fire Company will be offering bucket rides for a bird's eye view of Newport! Harleys 4 Heroes will be displaying their rides! NRPS thanks the Borough of Newport and Newport Fire Police for their assistance with Canal Day. After Canal Day, visit the Little Buffalo Festival from 12 pm to dusk. This free festival at Little Buffalo State Park features music on three stages, arts and crafts, a children's area and writer's nook! Find all of the details here: facebook.com/LittleBuffaloFestival. View Canal Day Parking in a larger map. For turn by turn directions, click on the Ps in the map. The Canal Day map and list of vendors is available as a PDF file. Applications are still rolling in! The following list will be updated through October 6th.